6 Stages Reverse Osmosis System. 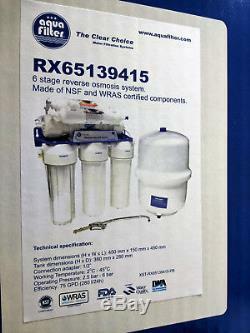 6 Stage Reverse Osmosis System, made of NSF and WRAS certified components. Due to the high membrane quality it is possible to purify up to 280 litres (75 GPD) of water per day. System is equipped with post filtration carbon cartridge (AICRO), which improves the taste and aroma of water and AIMRO mineralizing cartridge, which enriches water with elements such as calcium and magnesium. RX-RO6-AQM75 provides a continuous supply of clean, fresh drinking water. System is equipped with automatic shut-off valve to eliminate waste by closing the feed line when the tank is full. Sediment Filter: FCPS5 or FCPS20. Activated Coconut Shell Carbon Filter (GAC): FCCA. 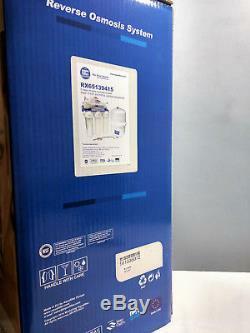 Reverse Osmosis Membrane 75 GPD per day: TFC-75F-AQM. Drinking and cooking water for house. Hand built & factory tested. System equipped with single faucet, all installation accessories, ready to install. Designed for enhanced dirt-holding capacity. Great tasting water for drinking and cooking. Less expensive than bottled water. System built with quick type fittings. Made of safe, food grade materials. The RX65139415 comes complete with the following cartridges: FCPS5, FCPS20, FCBL, FCCA, AICRO, AIMRO. RO membrane Aquafilter TFC-75F made of. / made in USA (75 GPD). 3.2 Gallons plastic water storage tank. NSF certified filter housing double. Automatic shut-off valve, mini flow restrictor, check valve. Colour coded 1/4 tubing for system connection. System dimension: 450 x 150 x 450 (mm). Tank dimension: 380 x 280 (mm). 2.8 bar (40 psi) max. 6.0 bar (90 psi). Typical rejection rate: 98% TDS. Iron: maximum 0.2 ppm. Goods ordered before 1pm will be sent out on the same day. We provide invoices with VAT separately displayed. The item "Aquafilter 6 Stage Reverse Osmosis System 75GPD For Drinking Water" is in sale since Thursday, March 1, 2018. 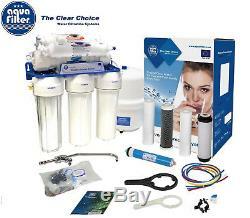 This item is in the category "Home, Furniture & DIY\Appliances\Small Kitchen Appliances\Water Purification\Water Filters".plus" and is located in Bridgwater. This item can be shipped to United Kingdom, Austria, Belgium, Bulgaria, Croatia, Cyprus, Czech republic, Denmark, Estonia, Finland, France, Germany, Greece, Hungary, Ireland, Italy, Latvia, Lithuania, Luxembourg, Malta, Netherlands, Poland, Portugal, Romania, Slovakia, Slovenia, Spain, Sweden, Australia, United States, Canada, Brazil, Japan, New Zealand, China, Israel, Hong Kong, Norway, Indonesia, Malaysia, Mexico, Singapore, South Korea, Switzerland, Taiwan, Thailand, Chile.